GRAND RAPIDS, Mich. (WOTV) – Hey Beauty Babes! Have you ever continued to take Pre-natal vitamins post-delivery because of the many beauty benefits in those tiny little capsules? Do you take a Hair, Skin & Nails vitamin supplement daily? Well you’re not alone beautiful; I wanna share some quick tips with you for your consideration on your next shopping trip. It protects against UV damage and slows signs of aging. It encourages healthy skin cell production which keeps skin firm and healthy. It protects against infection because the skin is the first line of defense against bacteria, pollutants and harmful irritants. How Much Should You Get? Women should aim for 700 mcg of vitamin A daily. When applied topically, it helps to smooth wrinkles. It evens skin tone and gives you a radiant glow. Vitamin A clears up acne. Vitamin C is an incredible anti-oxidant that helps neutralize oxidative stress and free radical damage on the skin and hair. It helps protect your skin from sun damage from the inside out. It communicates with our DNA and helps it repair and fix damaged skin when it has been cut, injured, burned or attacked by acne. If your nails are short and brittle, they could benefit greatly from Vitamin C.
It encourages the growth of strong, shiny hair and prevents premature graying of the hair. Consuming Vitamin C helps detoxify and cleanse the skin which reduces acne and pimples. When you apply vitamin C on your skin, it naturally tightens your skin, regulates your pores and makes your skin velvety smooth. Vitamin C is abundant in many foods. You can find high amounts of vitamin C in citrus fruits (oranges, lemons, and mandarins), cabbage, tomato, asparagus, berries and bell pepper. Today, with our busy lifestyles, it’s not always possible to eat a diet rich in Vitamin C, and that’s completely understandable. So, if you need to take a vitamin C supplement, choose a high quality, organic supplement. Vitamin E oil can nourish suntans and treat sun burn. It can lighten dark spots and scars. Application of vitamin E oil is a perfect way out to reduce and lighten the appearance of stretch marks. Vitamin E oil can stimulate hair growth and prevent premature graying. It acts as a fantastic moisturizer which rejuvenates and restores dehydrated skin. 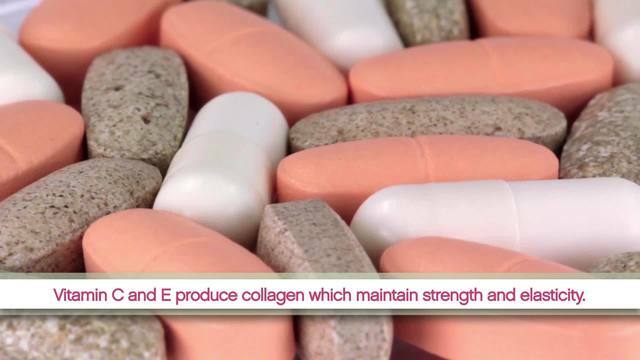 Vitamin E Oil and capsules can reverse premature skin aging and prevent wrinkles. You can apply Vitamin E oil on your face and wipe it off with a damp washcloth for better cleansing. It is a heavy emollient, and when you use it to clean your face, it pulls out the impurities significantly. Just a little amount of Vitamin E oil can help you keep those one of the most common ageing signs at bay. You can apply it with your regular moisturizer under your eyes to help lighten the dark circles. Woo Hoo! Vitamin E oil not only helps strengthen the hair follicles, but also prevents split ends.